We recognize parental involvement as a key factor to our success. Quite simply, we cannot accomplish everything we do without your help. Throughout the year, the Parent-Teachers-Faith Warriors will sponsor and support events that directly benefit and enrich the students of Bayshore Christian School. What is Parents, Teachers, Faith Warriors (PTFW)? All parents and/or guardians of children attending Bayshore Christian School, as well as, each member of the professional staff, are members of the PTFW and are encouraged to participate. PTFW will sponsor and support events that directly benefit and enrich the students of Bayshore Christian School. Our success is dependent on your active involvement. Active members of the PTFW consist of parents/guardians, teachers, and alumni who volunteer their time. We are an independent organization, and we do not belong to any state or national affiliation. We keep all funds that are raised by the PTFW for our school and are not required to contribute percentages to local, state, and/or national associations. The PTFW works with the school to evaluate and prioritize allocation of funds raised. Meetings will be monthly on the first Thursday of every month (except January 2019) beginning at 5:00 p.m. All meetings are open to all parents/guardians, teachers, and any extended member of the Bayshore family with an interest in helping! Meetings will also be live-streamed on the BCS Facebook page, which will allow those unable to attend to have an opportunity to comment and provide feedback in real time. May 2, 2019 at 5:00 p.m. in the Media Center. We have many volunteer opportunities as well as committee positions available. Print and complete this volunteer sheet and bring to the BCS office or to the next PTFW meeting. Birthday Shout Outs! - Have your child(ren)’s name displayed on the school marquee during their birthday month. The cost is $10, which can be billed to your FACTS account. Please send an email to let us know who and when you’d like to be recognized. Billing will occur when email is received. Sponsor a Bench! - There are new benches on the Red Top available for sponsorship. For $300, you can have a plaque attached, which can honor your favorite BCS student(s). We will bill your FACTS account upon receipt of your email request. We will contact you for the plaque inscription details. The PTFW is selling PDQ fundraising cards valued at $10 to be used at any PDQ location. We acquire them at a discount and can sell them to you for only $8! This is a guaranteed money maker for our school! The cards do not expire and retain their value, just like gift cards. You can also use them during PDQ spirit nights! They make great gifts and stocking stuffers. Please email the PTFW to purchase the cards. We had a wonderful time at this year's Faith Warrior run. Each division had various inflatables to keep them active and enjoying the day. Students raised over $21,000! Thank you to all our BCS family and friends who came out to support and volunteer. This year our annual spring gala brought us to Bayshore in Oz! Current families, donors, supporters, and alumni were able to enjoy a night filled with silent and live auctions, dinner, and dancing all in support of Bayshore Christian School. As of today, we have raised over $46,000 for the school. 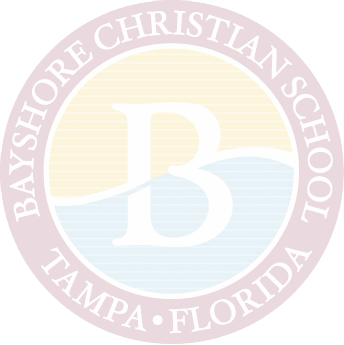 We want to thank everyone who came to celebrate and support Bayshore Christian School. It was yet another successful event that reminded us how very blessed we are by our community. It is not to late to make an impact. Donate online today! Look out for gala night pictures coming soon on the Spring Gala page. This is currently an open position. We want to hear from you! Please feel free to leave us a message in our mailbox in the School Office, or you can send the team an email here. Do you want to contribute but just don’t have the time to volunteer? Find out how you can give.